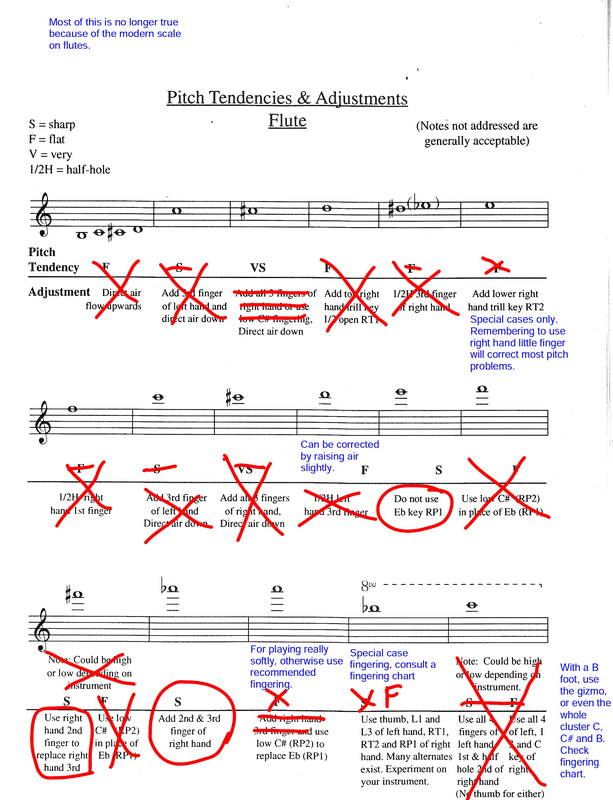 Only this week I came across a chart on a high school band website listing notes on the flute that have tuning problems with recommended fingerings for correcting pitch. It is taken from a Guide to the Understanding and Correction of Intonation Problems, Al Fabrizio, Meredith Music Publications, 1994. In looking through the chart, I realized that the advice it was giving was based on the old scale flutes that were available back in the early and mid-1990s. The scale of instruments has changed since that time. A LOT. When the modern flute was invented, the schematic of the placement of tone holes was based on a lower pitch than we play at today. “Normal” pitch in the mid-1800’s, according to Theobold Boehm, was A=435. Therefore, the schematic he created for the flute was for an instrument that played in tune at A=435. Over the rest of the 19th century and well into the 20th century, pitch has climbed to A=440 and even A=442 or in extreme cases A=444. For a really long time, the solution for getting a flute up to pitch was to make a shorter headjoint, by several millimeters over what would play in tune at A=435. The consequence of this practice was that the low register of the flute would be flat and the third octave would be sharp. The open C# would be hair-raisingly sharp. In order to have a hope of playing these flutes with short headjoints in tune, all kinds of compensating fingerings were created to correct the pitch. This included things like adding right hand fingers to lower the pitch of the C# and half-holing right hand keys. Student flutes with this older scale were widely available until fairly recently. Think old mainline American student brands, especially Armstrong, Gemeinhardt, Bundy, Artley, etc. Fortunately, there has been a revolution in flute making brewing from the mid-20th century started by flute makers and players including Albert Cooper, Eldred Spell, Trevor Wye, William Bennett and even James Galway to bring the schematic of the flute up to modern pitch. Most every flute made today, by every reputable manufacturer, at every price point, has a scale that has its basis in the work of these pioneering flute makers and players. Many of the old compensating fingerings are unnecessary and even undesirable with a modern scale. The first and second octaves are now in tune, and only minor adjustments are needed in the third octave. The C# is still an issue, but not because it isn’t in tune. It is more because it is the shortest tube and therefore the most bendable pitch. It also reveals the player’s expertise in focusing and directing the air correctly. If the C# sounds high, it means that the blowing angle is too shallow. It is absolutely true that if you can fix the pitch and tone quality of the C#, you will vastly improve the tone and intonation on the rest of the flute. More on tone, tuning and C# in another post. When was the last time your students had their instruments in the shop? How much of an impact do you think an instrument in poor condition has on a student’s ability to practice, prepare and perform? How often do you play check students’ instruments? 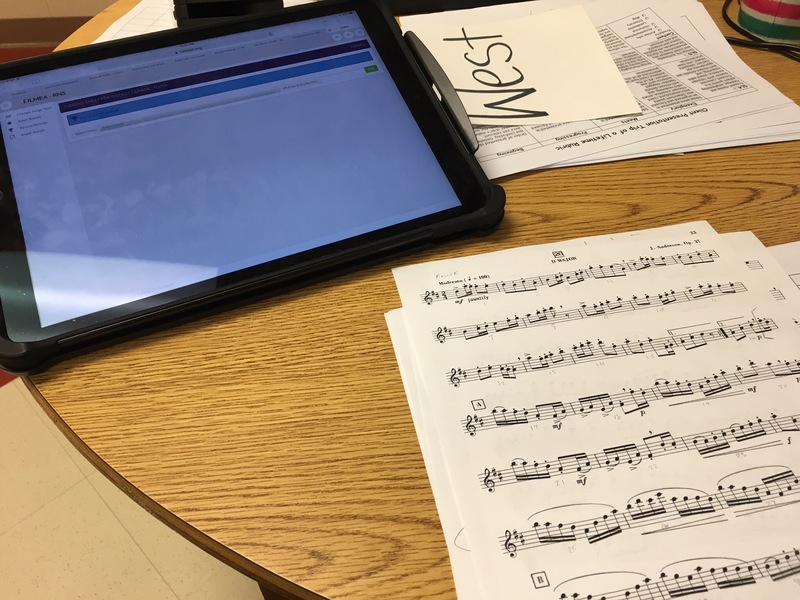 What do you do to ensure that students get high quality instruments from the start? Yesterday, I had the pleasure of adjudicating for a junior high Illinois MEA District band audition. The majority of the students I heard perform were playing on the flutes they started with, though maybe 15% of them had step-up instruments. There were a number of kids I heard whose flutes were in such bad shape that it was impossible to evaluate their performance because they could barely make a sound on them. There were even a couple kids who I was amazed could make any sound at all because their flutes were in such bad shape. On questioning these kids, I learned that their flutes had never been in the shop since they began playing 3-4 years prior. Fortunately there was a repair person on site from one of our local dealers that I could send them to, but it was too late in terms of their audition. In my own studio I regularly find that the students and their parents have no idea that a flute needs regular maintenance. Frequently, my recommendation that the instrument get serviced regularly is something that never occurred to students or parents. When they get repairs, the students are amazed at how good they sound. Make sure the flute is a quality brand to begin with. The reputable dealer in your area is the place to go for quality name brand instruments. Steer families away from inexpensive online “deals”. You truly get what you pay for. Communicate to parents that instruments need to go in the shop every 12-18 months to stay in good shape regardless of whether or not there is an emergency repair. It’s like maintaining an automobile. You wouldn’t drive around and never change the oil. The engine will eventually seize up. Many dealers have service contract agreements that are very reasonable for regular and emergency maintenance. Encourage parents to pop the few bucks for the convenience and peace of mind. Quick Fixes for Common Mechanical Problems are no substitute for regular maintenance. If you need to use a quick fix, the flute needs to go to the shop as soon as possible afterwards. If instruments are well maintained, a quick fix may never even be necessary. Play check instruments for leaks and check the headjoint cork to make sure it is tight and in the correct position. A loose cork will make the flute sound bad. An out of place cork will negatively affect the intonation of the flute. It has been a busy week of travel and performance for me, so I’m sharing an old post from last year that got a lot of views the first time around “Quick Fixes for Common Mechanical Problems”. 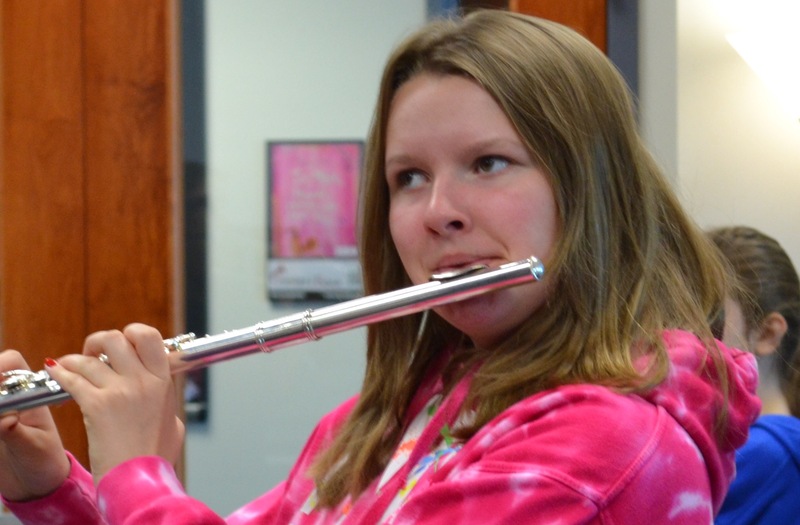 There is nothing worse than having a kid come to you the week of, or even the day of a concert or solo contest with a flute that isn’t playing. Here are a few suggestions for maintenance and what I call “chewing gum and rubber band” solutions for last minute emergencies. They won’t work in all cases, but often they will at least tide the student over until the flute can get proper service on their flute. See you next week with a new flute tip. Thanks for following Dr. Cate’s Flute Tips! If you find these entries useful, please subscribe, share with your colleagues and come back regularly for more flute tips. Feel free to comment. If you have a topic you would like to see explored more fully, you can contact me via IM/Messenger on Facebook or email me at dr_cate@sbcglobal.net. For information about clinics and workshops click here. What brand of flute do you recommend for the beginners in your band program? Why that particular one? If your response is, “That’s the one we’ve always gotten” or “This was the one that was recommended by my woodwind methods teacher when I was in college”, it might be worth reevaluating your choice because there have been so many improvements in student flutes in recent years. There are also brands on the market now that didn’t exist even five years ago. There are three main things that you should consider when making a choice of which brand to request from your local dealer. First is whether flute has a modern scale. There are old and venerable brands who haven’t changed their scale since they started making beginner flutes back in the day. The problem with the older scale is it was designed to play in tune at below A-440. In order to get the flute to play at A-440, the headjoint was shortened. Consequently, the low register is flat and the high register is sharp. When a beginner starts on an old scale flute, the student becomes acclimated to hearing the flute out of tune. For example, a screaming high Db and low Eb doesn’t bother them because that’s what they are used to. On flutes with an updated scale, the entire key schematic is slightly shorter so the entire range is better in tune. The newer quality brands have a modern scale. And slowly, the older brands are retooling and incorporating better scales in their beginner flutes. The second factor to consider is sturdiness. Like the proverbial Timex watch slogan of old, can the flute “take a licking and keep on ticking”? There has been a disturbing trend in recent years to use softer metals to save money in manufacturing. I’ve had way too many experiences in the past few years of seeing bent Ab keys, as in wrapped around the flute body, bent trill keys, twisted main line keys, footjoint keys bent open a 1/4″ or more. While it is true that these things happen because of mishandling by students, it is safe to say that the metals are too soft if the keys can be bent back as easily as bending a paper clip. Another dubious manufacturing trend is having adjustment screws anchored in a nylon slug rather than into threaded metal. In my experience, these screws slip much more easily and constantly need to be adjusted. Lastly, check the quality of the plating. Does it hold up well or does it pit or start to come off, showing the copper under layer? Thirdly, the quality of the cut of the blow hole can make a huge difference in developing a characteristic sound. There have been huge innovations in headjoint technology in the time I have been a flutist. Most flutists will tell you that the newer brands tend to have better sounding headjoints, though there have been recent improvements in the older brands as well. In conclusion my suggestions are: Learn as much as you can about all the quality brands available on the market today, both old and new. If you are intensely brand loyal but have concerns about some of the issues raised here, talk to the manufacturer representative in your area and voice your concerns. They do listen. If they hear the same concerns from enough people, things change for the better. If you find these entries helpful, please subscribe, share with your colleagues and come back next week for another flute tip. Please comment and feel free to ask questions. Maybe the answer to your question will be the next flute tip. Find me on Facebook or email me at dr_cate@sbcglobal.net. For information about clinics and workshops click here.